Mary, Mary, quite contrary, how does your garden to-do list grow? 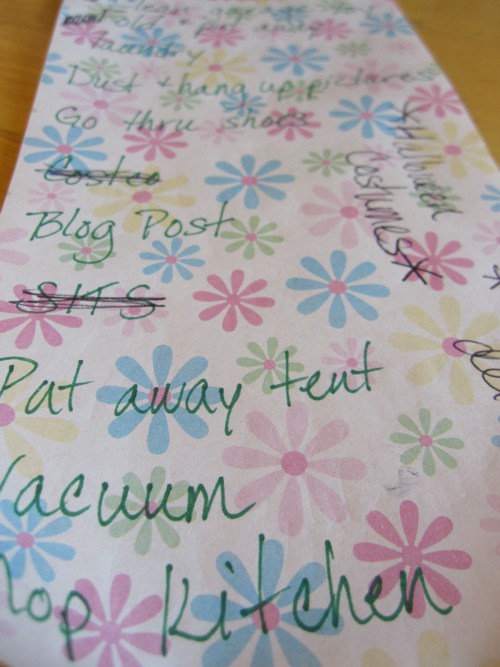 Is your to-do list like mine? It just seems to get longer and longer, and at the end of the day I can only cross off one or two things. And I’m not even writing down the things I need to do every day, like filling and emptying the dishwasher, making dinner and doing laundry! I really don’t have an answer to that question. I wish I had a set writing time; a time when I sit down and just write. I write when I have a few minutes here and there. If the kids are watching T.V., I try to write. Or when they are at school, I try to sneak some writing into my day. I publish my posts at odd times and on different days. I’m never consistent. I’m always “working” on a new post. That doesn’t mean I’m sitting at the computer all day, typing away furiously. If only I had the time! No, I just walk around in the grocery store, thoughts about my next post swirling around my brain, taking up the space that’s meant to remember to buy MILK. Usually, those posts sound much better in my head than they look written down. The reason I make time for my blog is because it has become one of my passions. And so I was delighted to get together for a cup of coffee with one of my friends last night to talk about my passion: blogging. She is an author and a middle school teacher; please go check her out! Her new blog is here: AJ Cattapan, and you can also find her on Twitter: @AJCattapan. AJ and I are both avid fans of Anne of Green Gables; so I was quite jealous when I discovered that AJ’s header was a photo she had taken on Prince Edward Island! I struggle finding time, too. I've tried setting a blogging schedule, but as soon as I do, something happens to interfere. So now I just fit it in when I can. What's funny to me is that I don't work outside the home and my kids are grown. So why can't I get it done? Why can't I find the time? I think I'm busier now than when my kids were at home. It's probably those darn grandkids – I have them here every chance I get and they expect my full attention! So I'll just have to keep blogging every chance I get. Thanks for the great promotion, Ginny! At least one person has already clicked through!